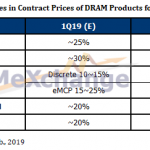 DRAMeXchange, a research division of TrendForce, reports that Samsung Electronics, with the support of the Korean government, is signing a memorandum of understanding (MOU) with China’s National Development and Reform Commission (NDRC) that should drive down DRAM price increases. The MOU is expected to consist of cooperation in the semiconductor industry, including further investment in China and technical collaboration. 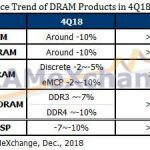 DRAMeXchange believes the MOU could moderate DRAM price increases across product lines and accelerate production capacity expansion. In December 2017, the NRDC expressed their concerns to Samsung as Chinese smartphone suppliers faced added cost pressures with rising DRAM prices over the previous six quarters. One of the main reasons for China’s clout over Samsung is its buying power. 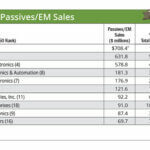 “China remains the largest importer of memory chips driven by its domestic and exporting demands, and 50 percent of Samsung’s revenue of DRAM comes from China,” said Wu. Therefore Samsung needs to respond to China’s concerns, she added. The MOU between NRDC and Samsung also is expected to impact the global memory market in two ways – price moderation and production capacity expansion. Although there is still tight supply, DRAM price hikes will be limited due to sluggish smartphone demand in the first quarter and intervention by the NDRC. IHS Markit recently released preliminary global unit shipments for smartphones in 2017, showing that shipments dropped by 4.5 percent in the fourth quarter. 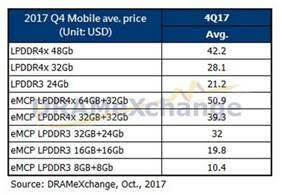 “As for our forecasts of mobile DRAM prices in Q1, the price moderation will result from intervention by NRDC, the MOU, as well as slowing smartphone sales in the off-season, especially weaker sales momentum from China,” said Wu. 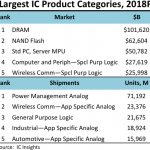 At the same time the profit margin of mobile DRAM is much lower than other products and suppliers may continue to shift their existing production capacity from mobile DRAM to other products with higher gross margins, Wu said. 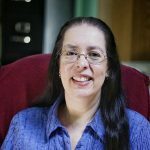 This may result in lower price increases of other products as well, she continued. 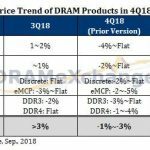 Mobile DRAM contract prices are expected to rise by three percent in the first quarter of 2018, down from the original forecast of five percent, according to TrendForce. 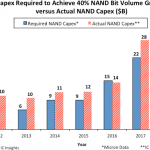 “For now, we are still not able to forecast exactly how much the MOU will drive down DRAM pricing, because it depends on the reaction of suppliers to a large extent. For instance, we need to know more about their detailed plans of production capacity expansion,” Wu explained. However, the MOU is expected to influence the expansion of production capacity among the DRAM leaders. New bit output for DRAM is still not available, resulting in ongoing undersupply, said Wu. However, DRAMeXchange believes that suppliers may opt to expand production capacity if the Chinese government intervenes in pricing and suppliers find it difficult to lower costs. “Increasing the bit output by production capacity expansion will not only stabilize the price, but also allow suppliers to maintain the absolute amount of profit of DRAM products,” according to Wu. DRAMeXchange expects the MOU to be completed in the first quarter of 2018.